Ultimate X-Men #15 is my single favorite X-Men story of all time. Everything important and potentially progressive about the entire concept is contained within this 22 page story, titled “It Doesn’t Have To Be This Way,” and on top of that, I think it’s easily one of the best scripts that Mark Millar has ever written in his lengthy career. Everybody knows that Millar brings the big action more (and better) than most other active comic book writers, and this “widescreen” storytelling aesthetic has become a staple of his own personal approach to comics. So how then is this particular script, whose most violent scene is a snowball fight, one of the best stories he’s ever scripted? Could it be that for all the acclaim Millar receives for the pacing and staging on his signature action sequences, that he’s just as capable of serving up some fantastic character work as well? Obviously, his impressive resumé suggests as much, and Ultimate X-Men #15 is one of many instances that prove he really can have it both ways. So after twelve issues of pounding explosions, brutal fight scenes, and all manner of general badassery, Millar delivers has true vision for the X-Men franchise—a pacifist manifesto that tweaks everything he’s done up until this point, and will inform everything he attempted in the last half of his popular run. 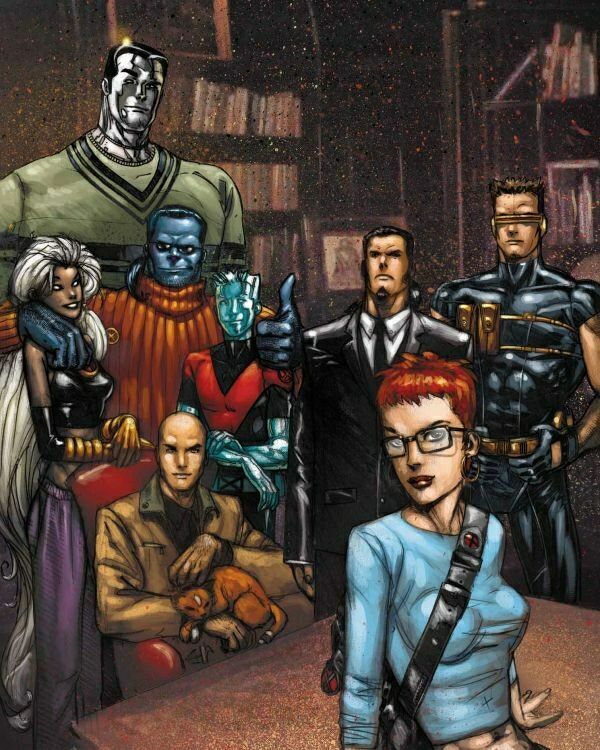 Charles Xavier writing an exclusive article for a national magazine provides a narrative frame for Millar to clearly and decisively outline a progressive vision for the future of mutantkind in the Ultimate universe. No corner of the issue is left unexplored, and the story reminds everyone that Xavier has also been at his best when characterized as a true academic visionary, who wishes to impart more upon his students than complex attack formations. The genetic abilities of his young students are defined and explored in very practical applications that would be of great benefit to humanity, if they could only push past their crushing fear and intolerance. Despite the incredible things we’ve witnessed thus far from all the characters, none of those manifestations come close to having the kind of far-reaching societal impact that they do here. Jean helping the police find missing persons. Storm helping farmers hampered by drought. Cyclops becoming a mentor for underprivileged teens. Bobby feeding the homeless. Wolverine and Colossus heading out into the night to offer a particular brand of justice. Every single one of these things is incredibly more interesting than watching them smash Sentinels to bits, or break free from a renegade SHIELD program. These are very tangible ways that young, trained kids with mutant abilities can make their world a better, safer place, and it felt so much more compelling than your usual superhero story. I mean, what kind of superpeople aren’t satisfied spending all their free time fighting other superpeople in huge, world-shaking, widescreen battles? What the hell kind of X-Men book would that be? The answer of course is one that had the potential to truly fulfill the initial promise of the Ultimate universe, which was to offer a more contemporary interpretation of the classic Marvel characters and franchises. But even more than that, was the idea that here in these books, nothing was certain and anything can happen. Uncle Ben could appear in four to five issues of Ultimate Spider-Man before he had that fateful encounter with a desperate criminal. Wolverine could infiltrate Xavier’s mansion with orders from Magneto to kill him, only to be quickly led off course by a need to get Jean Grey into bed. This standalone story continued that unpredictable trend, setting into motion a far more progressive mission statement for the X-Men, one that doesn’t rely on a series of endless and often mindless battles with other costumed misfits. Which are exciting for the most part, but deviating ever so slightly from the backdrop of prejudice and intolerance that allows the book to say something that’s not only interesting, but important and socially relevant. To more fully explore questions like—how far should one go to protect a world that fears and hates them? And will the future of humanity be ultimately decided during grand battles, or with the exchange of grand ideas? This kind of approach to an X-Men title was exactly the point of the Ultimate line of books, and this story will always stand as one of several high marks that the imprint reached in its first couple years of business. Millar would be responsible for a great number of them, and like many of the other writers that’ve been featured in this series of columns, expect more of his work to be discussed and celebrated here. Until then, I leave you with an excerpt from Xavier’s unpublished essay, and a conversation between him and young Bobby Drake that contains one of the greatest closing lines I’ve ever read in a comic. “Yeah. How can they say your piece was too pro–mutant and insensitive to all the people who died in The Brotherhood’s terrorist attacks?